Lilyan Tashman (October 23, 1896 – March 21, 1934) was an American vaudeville, Broadway, and film actress. Tashman was best known for her supporting roles as tongue-in-cheek villainesses and the vindictive "other woman." She made 66 films over the course of her Hollywood career and although she never obtained superstar status, her cinematic performances are described as "sharp, clever and have aged little over the decades." Tall, blonde, and slender with fox-like features and a throaty voice, Tashman freelanced as a fashion and artist's model in New York City. By 1914 she was an experienced vaudevillian, appearing in Ziegfeld Follies between 1916 and 1918. 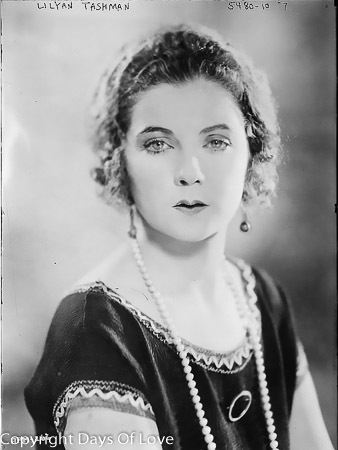 In 1921 Tashman made her film debut in Experience, and over the next decade and a half she appeared in numerous silent films. With her husky contralto singing voice she easily navigated the transition to sound film. Tashman married vaudevillian Al Lee in 1914, but they divorced in 1921. She married actor Edmund Lowe in 1925 and her wardrobe and lavish parties became the talk of the town. She died of cancer in New York City on March 21, 1934 at the age of 37. Her last film, Frankie and Johnny, was released posthumously in 1936. On September 21, 1925, Tashman married longtime friend Edmund Lowe, the well-known actor. The two became the darlings of Hollywood reporters and were touted in fan magazines as having "the ideal marriage". Tashman was described by reporter Gladys Hall as "the most gleaming, glittering, moderne, hard-surfaced, and distingué woman in all of Hollywood". The couple entertained lavishly at "Lilowe", their Beverly Hills home, and their weekly party invitations were highly sought after. Her wardrobe cost $1 million, and women around the world clamored for copies of her hats, gowns, and jewelry. Servants were ordered to serve her cats afternoon tea, and for Easter brunch she had her dining room painted dark blue to provide a contrast to her blonde hair. She once painted her Malibu home red and white, asked her guests to wear red and white, and even dyed the toilet paper red and white. In 1932, Tashman entered the hospital in New York City for an appendectomy that is now considered a concealment for abdominal cancer. She left the hospital thin and weak. Although she made five films in her last years, performing with her usual artistry and professionalism, she weakened significantly in the months following her hospitalization and her role in Riptide was trimmed because of her ever-worsening health. In February 1934, she flew to New York City to film Frankie and Johnny for All Star Productions (released by Republic Pictures) but her condition necessitated a week of rest in Connecticut with Lowe. She resumed work in March, completing her film role on March 8 and then appearing at the Israel Orphan's Home benefit on March 10. When she entered the hospital for surgery on March 16, it was too late for the doctors to help her. Tashman died of cancer at Doctor's Hospital in New York City on March 21, 1934 at the age of 37. Her funeral was held on March 22 in New York City synagogue Temple Emanu-El with Sophie Tucker, Mary Pickford, Fanny Brice, Cecil Beaton, Jack Benny, and other distinguished celebrities in attendance. Eddie Cantor delivered the eulogy. The burial in Brooklyn's Washington Cemetery attracted 10,000 fans, mourners, and curious onlookers; it became a near riot when people were injured and a gravestone was toppled. Tashman left no will, but the distribution of her $31,000 in cash and $121,000 in furs and jewels provoked contentious discussion among her husband and sisters, Hattie and Jennie. Her last film, Frankie and Johnny, was released posthumously in May 1936 with her role as Nellie Bly cut to a cameo. McLellan, Diana (2000). The Girls: Sappho Goes to Hollywood. New York: Macmillan. pp. 68–9, 74–5. ISBN 0-312-24647-1. Golden, Eve. "Lilyan Tashman: Show Girl in Hollywood". Classic Images. Archived from the original on 2009-07-23. Retrieved 2009-12-20. "Morris Tashman (1856 - 1924) - Find A Grave Memorial". Retrieved 24 April 2016. Faderman, Lillian; Timmons, Stuart (2006). Gay L.A.: A History of Sexual Outlaws, Power Politics, and Lipstick Lesbians. New York: Basic Books. pp. 41, 63–4. ISBN 978-0-465-02288-5. Fleming, E. J. (2004). The Fixers: Eddie Mannix, Howard Strickling, and the MGM Publicity Machine. McFarland. p. 105. ISBN 0-7864-2027-8. Wilson, Scott. Resting Places: The Burial Sites of More Than 14,000 Famous Persons, 3d ed. : 2 (Kindle Location 46143). McFarland & Company, Inc., Publishers. Kindle Edition.